In IntelliJ IDEA 11 we’ve improved Android logcat view, so now watching the logs of your applications became much more convenient. This is really great, and matches (perhaps even improves on) the Android logcat in Eclipse. One area that I think is unclear is how the PID should be used. 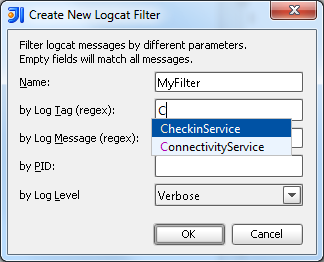 Would it be possible to have a checkbox to restrict logcat output to the PID of the process that the app being developed is running as? That would be more convenient than having to edit the filter each time the process is relaunched to match the PID. Newest DDMS has the ability to filter by application name, it’s incredible useful. This should give me all myTags Plus the error messages? Thanks, being able to mark several would be the desired result. It seems not to work until now, but is a real minor issue for me. Just wanted to see if it is already in the program. *Really* needs a way to filter by package or a way to filter by this PID. Using the raw PID numbers is kind of useless. What kind of regexes are allowed? @Dirk did you find a solution for that negation? I too would like a negative filter. Especially now that the programmers of Jelly Bean garbage collector forgot of there «DEBUG/dalvikvm(23859): GC_CONCURRENT» message — which logs about twice a second. will remove messages from dalvikvm and Email. Martin I’d reach through this computer and hug you if it was possible. I added some more concrete strings to exclude in your regex and now I can actually follow multiple runs of my program. Headache reduced. Is there any way to add all filter logcats created to an IntelliJ plugin? Problem with all configurations related to a project is that whenever we change projects we lose some of them. I would like to keep all saved logcats through a plugin.